LAWRENCEBURG, Ind. 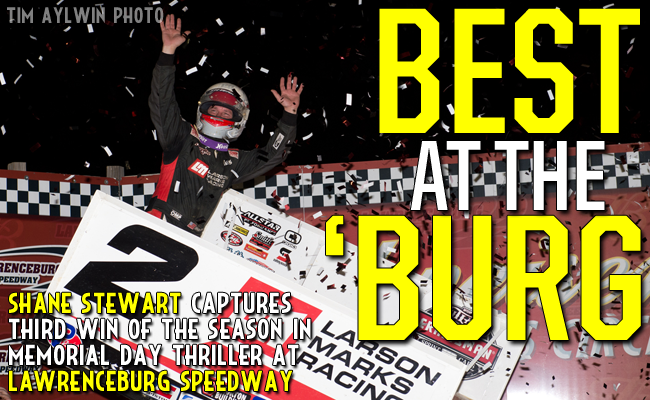 - May 30, 2016 - After dominating on Friday night at The Dirt Track at Charlotte and coming up one spot short of the win, Shane Stewart managed to overcome the heartache to score his third World of Outlaws Craftsman® Sprint Car Series victory of the 2016 season on Monday night in a Memorial Day thriller at Lawrenceburg (Ind.) Speedway. Stewart, whose most recent win came at Devil's Bowl Speedway over a month ago, had to hold off challenges from NASCAR Camping World Truck Series driver, Rico Abreu, and David Gravel to capture the checkered flag. "I try to drive hard every night, and sometimes it probably doesn't look like it," Stewart said. "I'm just happy I can win on Memorial Day - I know it's a special weekend for some and probably not so special for others, but I just got to thank all the men and women that served our country and have given us the opportunity to come out here and do what we love." With just a handful of laps remaining, Gravel in the Big Game Treestands/JRC No. 5, muscled his way around Abreu for the second position and challenged Stewart for the win, but came up just short of the victory as he captured his second podium finish since winning at Tri-State Speedway on May 14. "We have a lot of podium finishes this year, it seems every time we start on the front row, we win," Gravel said. "Hopefully we can get a win when we don't start on the front row, but I think we found something tonight and I am really happy how we ended the feature there." Abreu, who joined NASCAR stars Kyle Larson, Kasey Kahne and Christopher Bell in the feature at Lawrenceburg, finished third, which is his best World of Outlaws finish of the season. "I was just really searching [at the end of the race]," Abreu said. "You can't really run the same line as these guys - it's really hard because of all the turbulence these wings make. You just have to search and that's the benefit of running second, because you can see what the guy in front of you is doing." To start the night, Joey Saldana claimed his series-leading seventh quick time award when he bested Gravel and NASCAR Sprint Cup Series driver, and Larson Marks Racing co-owner, Kyle Larson, with a lap of 12.185 seconds. When the heat races started, the first three were dominated by the driver that started on the pole as the track continued to rubber up. The final heat race provided a better preview of the racing to come later in the night as Stewart, in the American Born Moonshine/Eneos Oil No. 2, rocketed around pole-sitter Daryn Pittman to score the win. Finishing second in the fourth heat proved to be a lucky break for Pittman, as an invert draw of eight placed the Kasey Kahne Racing with Mike Curb driver on the pole for the six-lap dash. Again, Pittman could not capitalize on the front-row starting position, as he finished second to Abreu, who utilized the famous dirt track slide job to score the victory and the pole for the 35-lap feature. Abreu started on the pole for the feature race, with Pittman starting to his outside, but when the green flag dropped, it was Pittman who jumped out front. Even with two early cautions, Pittman was able to control the top spot for the beginning of the race. Pittman led the opening four laps, but fell victim to changing track conditions, as he was passed by Stewart, who had made his way to the top spot from the third starting position. Déjà vu began to set in for the native of Bixby, Okla., as he dominated the mid-stages of the race before he hit lapped traffic, which allowed second place Abreu, in the Abreu Vineyards/Alpine Stars No. 24, to close the gap. Stewart could not hold off Abreu who took the lead on lap 25. Unlike a few nights earlier at The Dirt Track at Charlotte, Stewart did not fade down the stretch, instead he stayed glued to Abreu's rear bumper and took the lead back on lap 27.Over the course of five laps, Stewart and Abreu swapped the lead back-and-forth four times before Stewart captured the lead for the final time on lap 29. "My car was pretty good but my right rear tire was shot, and I knew that," Stewart said. "I felt pretty good in one and two, but I was a lot in three and four, and just when I thought I had a little bit of breathing room, here came Rico again, throwing me a slider. "That's the thing, you can't relax, and I did when we got to lapped traffic. Sometimes you're a sitting duck when you're the leader and you don't know how far to pace yourself and you kind of have to judge off of lapped cars. It got to a point where I wasn't getting around them and I started taking a little rubber off the cushion one and two, and that honestly saved me." Stewart did not have the luxury of coasting to his third World of Outlaws victory of the season, as a hard-charging Gravel made his way around Abreu for second and quickly closed in on the leader. In the end, Stewart was able to hold off a last lap charge by Gravel to secure the checkered flag in a Memorial Day thriller at Lawrenceburg Speedway. "These young kids are so good, and as you can tell they just have tons of talent," Stewart said. "It doesn't matter what they jump into, they're going to be competitive. "I knew Kyle [Larson] and Christopher [Bell] were coming to run with us - they do a heck of a job and they made me earn that one for sure." Gravel returns to the podium following a two-race skid in which the Watertown, Conn. driver failed to finish inside the top five. "Rico and Shane were putting on a hell of a battle and I was just kind of watching those guys," Gravel said. "I found something down low - it was taking a little bit of rubber - and if we had another lap or two I think I could've gotten him. We were all over him there at the checkered, but just a little too late. Abreu led laps early and was the highest finishing NASCAR star, as Larson (fifth), Bell (seventh) and Kahne (14th) each started the feature but did not finish as well as the St. Helena, Calif. driver. "Thanks to all the fans, you know its Memorial Day and a Monday night and there's a lot of dedicated fans here," Abreu added. "I'm happy to be able to race in front of all you guys, and once again, thank you all for coming out." Seven-time World of Outlaws champion Donny Schatz continues to cut into points leader Brad Sweet's lead, as he finished sixth while Sweet finished eighth. Sweet now sits just 37 points ahead of Schatz. The World of Outlaws Craftsman Sprint Car Series will travel into the Buckeye State for the Kistler Engines Smackdown at Fremont (Ohio) Speedway on Friday, June 3. For more race information and ticket purchasing options, visit: www.WoOSprint.com/Fremont-Speedway. RACE NOTES: Joey Saldana captures his series-leading seventh quick time award...Within the last two events, Shane Stewart has led 53 total laps which gives him 82 laps led so far in 2016, the fourth most among all drivers...Since winning at Weedsport Speedway on May 22, Donny Schatz has an average finish of seventh over the last three races. CONTINGENCY WINNERS - MSD Ignitions ($25 cash): Paul McMahan; MSD Ignitions ($50 cash): Shane Stewart; Penske Shocks ($50 cash): Donny Schatz; JE Pistons ($50 cash): Daryn Pittman; VP Racing Fuels ($50 cash): Brad Sweet; Edelbrock ($50 cash): Joey Saldana; Comp Cams ($50 cash): Joey Saldana; Morton Buildings ($50 cash): Brady Bacon; Cometic Gasket ($50 cash): Logan Schuchart; Super Flow ($50 cash): Jason Johnson; Craftsman/Sears ($100 cash): Rico Abreu;KSE Racing Products ($100 product certificate): Gary Taylor; Comp Cams ($50 product certificate): Shane Stewart; JE Pistons (Set of Rings): Jason Johnson; JE Pistons (Set of Rings): Paul McMahan. SEASON WINNERS: ); Donny Schatz - 7 (Volusia Speedway Park on Feb. 14, The Dirt Track at Las Vegas on March 4, Stockton Dirt Track on March 18, Stockton Dirt Track on March 19, Silver Dollar Speedway on April 2, Lincoln Speedway on May 19, Weedsport Speedway on May 22); Brad Sweet - 6 (Volusia Speedway Park on Feb. 13, Volusia Speedway Park on Feb. 14, Cotton Bowl Speedway on Feb. 26, Ocean Speedway on April 1, Bakersfield Speedway on April 15, Plymouth Speedway on May 13); Daryn Pittman - 4 (Royal Purple Raceway on Feb. 27, Perris Auto Speedway on April 16, USA Raceway on April 18, New Egypt Speedway on May 24); Shane Stewart - 3 (Arizona Speedway on March 6, Devil's Bowl Speedway on April 23, Lawrenceburg Speedway on May 30); David Gravel - 2 (Thunderbowl Raceway on March 12, Tri-State Speedway on May 14); Joey Saldana - 2 (The Dirt Track at Las Vegas on March 3, Devil's Bowl Speedway on April 22); Lance Dewease - 1 (Williams Grove Speedway on May 20); Jason Johnson - 1 (Placerville Speedway on March 24); Jason Sides - 1 (I-30 Speedway on April 26); Greg Wilson - 1 (The Dirt Track at Charlotte on May 27). World of Outlaws Craftsman® Sprint Car Series Statistical Report; Lawrenceburg (Ind.) Speedway; May 30, 2016. Last Chance Showdown - (12 Laps - Top 4 finishers transfer to the A-feature) - 1. 11K-Kraig Kinser [-]; 2. 23C-Tyler Courtney [-]; 3. 49D-Shawn Dancer [-]; 4. 1ST-Gary Taylor [-]; 5. 2X-Parker Price-Miller [$200]; 6. 10H-Chad Kemenah [$200]; 7. 11N-Randy Hannagan [$200]; 8. 4K-Kody Kinser [$200]; 9. 6-Bill Rose [$200]; 10. W20-Greg Wilson [$200]; 11. 1A-Jacob Allen [$200]; 12. 10P-Jim Perricone [$200]; 13. 71M-Paul May [$200]; 14. 7S-Jason Sides [$200].